You may know Mayim Bialik best from her awesome and quirky work as Blossom on the show of the same name. Or you may know her as Amy Farrah Fowler on The Big Bang Theory. But here at the Nosher we know her as a blogger and writer extraordinaire over at Kveller.com. Mayim has previously written about making fruit faces for her boys when they are sick, and she has given us three of her favorite (vegan!) Passover recipes. These mini-kugels are a fantastic idea–making them in a muffin tin means it’s so easy to know exactly how many portions you have, and leftover from the seder are easy to grab and take for a lunch or snack during the week of Passover. 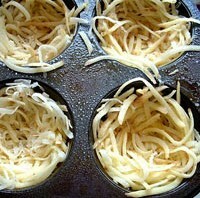 Grate the potatoes, and then drain the liquid from them. Saute the grated onion in 2 Tablespoons of the olive oil until soft but not brown. Add paprika. Mix onions into the potatoes and add potato starch and 1 more Tablespoon olive oil. Push into greased muffin tins, filling each muffin space all the way to the top, and spritz with a little more oil. Bake at 400F for 40 minutes.